Click here for our special 'Project 1975' website. Stedelijk Museum Bureau Amsterdam has launched Project ‘1975’, a two-year programme exploring the relationship between contemporary art and colonialism. How do artists view the historic or contemporary acts of colonial powers? What role does visual culture play in today’s colonial practices? In the art world, what has come to replace the tacitly embraced multicultural normalization of the nineteen-nineties? In a programme spanning exhibitions, seminars and publications, SMBA focuses on these and other issues, and adds its voice to the globalisation debate. Project ‘1975’ invites critical thinkers from all over the world to investigate the various facets and consequences of colonialisation. Attention will also be turned on the specific situation of the Netherlands; ‘1975’ is the year in which the Netherlands became more or less postcolonial. Nevertheless, the question remains: can historic and present-day relations be considered truly postcolonial if relationships between societies persist in being economically and culturally unequal and, to some extent, involuntary. Project ‘1975’ offers a platform to artists and thinkers who reflect on the meaning of this postcolonialism. Project ‘1975’ is, in all respects, a ‘programme in progress’. Exhibitions, seminars, publications and other activities will be held based on ongoing research and the input of guest programmers and partner institutions. 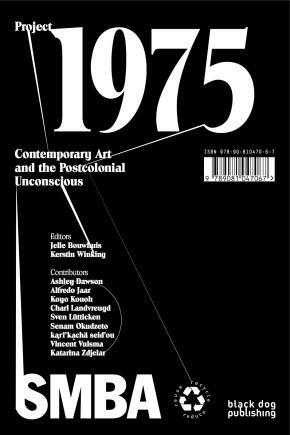 Project ‘1975’ will conclude at the end of 2012 with a survey publication documenting the lectures, exhibitions, interviews and debates, thus shedding light on a geographic broadening and deepening of reflections on contemporary art from the specific perspective of a contemporary art institute in Amsterdam. This will be clear not only in, for instance, the artworks and artists selected for the programme, but also largely in the delineation and discussion of positions in the inevitable transcultural process that comprises globalisation. From which premise, Project ‘1975’ invites its visitors, viewers and readers to reconsider familiar and prevailing modes of thinking on visual culture and fine art in particular. By way of a preliminary survey, SMBA has built up a network of artists and curators on the African continent, who will also be involved in the programme. Project ‘1975’ launches in December 2010. At the beginning of 2009 the SMBA team started a research project under the title ‘Africa Reflected’. This project looks closely at representations of Africa within contemporary art production, with the aim of finding alternatives to predominantly stereotypical mass media representations. The research is designed to arrive at a critical discourse: it is after all about how our images of Africa are shaped, and how we seek to nuance this with the support of visual art, and not about ‘development work’ which reinforces the average European citizen’s dominant image of Africa. Africa Reflected is comprised of manifold research components ranging from literature study to (inter)national studio and gallery visits, expert consults and a curators' meeting to take place in October, 2009. Parts of the program for the curators' meeting will be open to the public so that curators, artists, students and other parties will have opportunities to exchange views and discuss representations of Africa in relation to contemporary art and exhibition practices. After all, the research project is meant to serve as a basis for future exhibition projects. Each year SMBA organises an annual curators meeting, which brings international curators together with cultural producers active in Amsterdam. Unlike earlier editions, this year’s get-together is accompanied by a public side-program consisting of a seminar, a lecture and a video screening. The lecture as well as the video screening will be freely accessible to the public, while students for the seminar will be selected on the basis of their motivation. Information on all events and short biographies of this year’s invited curators are to be found hereunder. Project 1975 started as a two-year program of Stedelijk Museum Bureau Amsterdam. The project was set on exploring the relationship between contemporary art and postcoloniality, which gains more and more relevance to artists and thinkers in a context of a globalizing art world. It addressed key questions such as: How do artists today view the historic or contemporary acts of colonial powers? Do colonial mindsets persist ?in art and its institutions? What can replace the tacitly embraced multicultural normalization of the 1990s? These questions elicited versatile artistic and critical responses, many of which are presented and discussed in freshly released volume Project 1975 - Contemporary Art and the Postcolonial Unconscious.